May 5th is Cinco de Vino Day! Oh me, oh my, oh! It’s Cinco de Vino! Okay, so it’s really Cinco de Mayo, but come on! Loving all things wine, what else are we gonna’ talk about? Mexican food with wine, you say? If you’ve never ventured into pairing wine with your favorite Mexican food, trust us. It’s as fun as it is easy! Let’s start with a little hint: alcohol intensifies the heat of chiles, and chiles intensify the alcohol, so choosing lower alcohol wines is the first step. The second step is to choose those that are crisp with acidity. They’re best suited to complement the complex flavors and spices of great Mexican cuisine. And thirdly, always pair the wine with the sauce, not the protein. i.e., consider the ingredients in your dishes. In general, red wines will work best with earthy chipotle, pasilla or adobo chile sauces – or if it’s all about that cheese! White wines will work better with lime, citrus, tomatillo and cilantro or herbal sauces. Cinchy, huh? Some particularly good white varietals to consider might include Sauvignon Blanc, Pinot Grigio, an Albarino – or even a dry Riesling. Red wine lovers should try Tempranillo, Sangiovese or Malbec, a luscious Zinfandel or even a supple Syrah. But, like we always say, wine guidelines and suggested pairings are just that – suggestions. The right wine for you is the one you like best! We just recommend that if you’re entertaining, play it safe and have a couple of different options available. There’s a Temecula Valley wine out there that will make your Mexican fiesta excelente and take your meal from tasty to sabroso! or Danza del Sol “Sabroso”, a Late Harvest Sauvignon Blanc – perfect for dessert! Posted in 5 Facts About Wine..., Association News, Wine Pairing Guide, Winery News | Comments Off on May 5th is Cinco de Vino Day! Grandma’s stuffing, Aunt Susie’s cranberry sauce and your sister’s sweet potatoes. Menu: done! But what about the wine? Choosing a bottle (or two!) of wine to bring to the holiday table can be tricky. Appealing to not only your menu, but to a cross-section of practiced palates and novice wine drinkers may seem challenging. But don’t stress out over one of the simplest tasks of the holiday season. Make it simple. Any wine you enjoy is a good wine! One certainly doesn’t need to look to others to rate, score or direct you to make a particular wine choice. Bring a wine you’re familiar with to the table. Chances are it’ll be just fine – and maybe even sublime! Ham just begs for a something lightly sweet. Look for wines with a touch of residual sugar like a Baily Vineyard & Winery Riesling or a Maurice Car’rie Winery Gewurztraminer. Both are lighter in style, a bit lower in alcohol and still offer plenty of food-friendly acidity and crowd-pleasing palate appeal. If you’re looking for an easy to pair red, go for a lighter style like Tempranillo. Great examples can be found at both Miramonte Winery and at Danza del Sol Winery. Although an array of whites work perfectly well, Sauvignon Blanc is an all-time, hands-down favorite pick that holds up well to turkey – and all it’s side dishes. 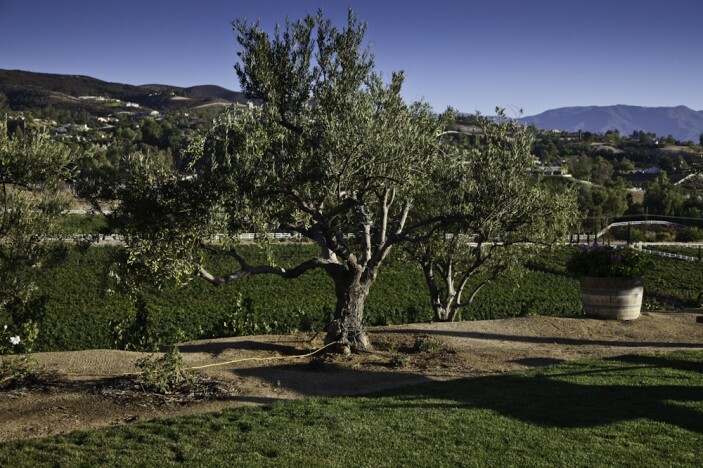 Temecula Valley provides the perfect playground for growing this varietal, so you’ll find many great examples of it here. Beautifully aromatic offerings from the musqué clone can be found at Hart Winery and at South Coast Winery Resort & Spa. Soft red varietals like Syrah also make suitable partners; you can find some fabulous ones at Falkner Winery and Leoness Cellars. White wines will have a hard time keeping up with the likes of Prime Rib, but there are so many reds to choose from that make impressive cohorts, you’re sure to find one you’ll all enjoy. Choose an affable Cabernet Sauvignon from Callaway Vineyard & Winery, a food friendly Italian varietal like Montepulciano or Sangiovese from Cougar Vineyard & Winery or an amazing Super Tuscan blend, Due Rossi, from Palumbo Family Vineyards & Winery. 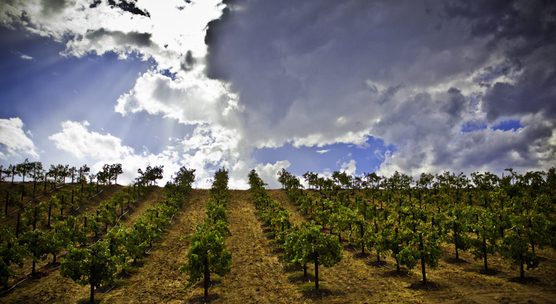 Here in Temecula Valley Wine Country, we’re still seeing the warm days of summer, along with cool, crisp evenings…..just the kind of weather that makes the grapes in the vineyard happy! If you are looking for a light, refreshing dish to serve on a warm summer afternoon, look no further….we’ve got it for you! Place crab in a bowl and run fingers through it to check for pieces of shell. Break up crab a bit with fingertips, but leave several large pieces. Add chili sauce, lemon zest and juice, parsley, hot sauce and Worcestershire to the bowl and toss to combine. In a food processor, process the chopped veggies into small bits by hitting pulse several times. Line a plate with a few sheets of paper towel. Scrape veggies onto towel to remove liquids. Transfer chopped celery, pepper, garlic and onions to the crab. Stir to combine veggies and season the salad with coarse salt and pepper to taste. Place crab salad in a serving bowl and top with crackers. Surround the salad with lettuce “cups”. Spoon the salad into the crunchy pieces of iceberg as you eat. Summer has arrived in Temecula Valley, CA! Join us for seasonal events, tasty meals and of course, to celebrate Father’s Day. Our wineries are offering mid-week activities along with weekend shindigs which will quickly fill your calendar. See what Temecula wines will be winning your heart this month! The Spirit of Great Oak Marching Band, Color Guard, Drum Line & Jazz Ensemble. Deadline to buy tickets is June 5th, call Terry at 951-795-1716. Bring your well-mannered pooch to lunch! Tours and vertical tasting of library Boudreaux reds. Food items available for purchase. Call 951-308-1098 to make reservations. Reservations are not required. No cover. Every Sunday at Meritage from 4p-8p in the main dining room. Watermelon Sangria & live music from local musicians begins at 5pm. No cover charge and no reservations required. Blending event + appetizers and attendees receive 10% off red wines. All RSVP’s must be in writing. RSVP to events@cougarvineyards.com. Call 951-491-0825 for any questions. Enjoy 3 handcrafted wines with Mad Mike’s Sausages. Every Sunday in June from 12:00p-3:00p. Release of hot new wine collection: “The Crush Club”. Buffet style dinner, cigar and glass of wine. Desperado – A Tribute to the Eagles! $25 pp + 2 drink minimum. Wahoo’s catering. $15 per student; $12 for wine club members. You will be served 3 sparkling wines paired with artisanal cheeses. Learn fun facts about sparkling wines & champagne. In our Blending Class, you get to be the Winemaker! Ooption to bottle your custom blend for an additional $29. Taste varietals from different areas in the Rhone region of France. 3 wine tastings and 8 tastings of Avocado Oil and Balsamic Vinegars. We recommend that you have taken Wine Tasting 101 class prior to this course. Custom five-course menu just for you. Call 951-491-8077 to reserve your table today. Enjoy half priced mimosas, sangria & Spumante Diamante. Enjoy with our Winemakers Reserve bottles of South Coast Wines. Single and want to mingle? Private, plated wine & cheese pairing with a Wine Concierge. Reservations strongly suggested: Call 951.587.9463 x7219. Join Executive Chef Jeff D. Massey and learn his secrets on the BBQ. Celebrate Father’s Day weekend w/ tasting of 4 Syrahs along w/ bacon dishes. Traditional Louisiana style Crawfish Boil & Blues. Boil crawfish and “blues” it up with the Nathan James Band! 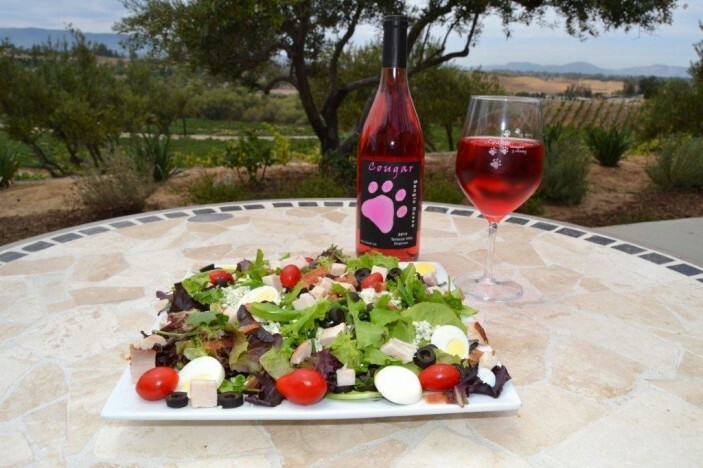 Recipe courtesy of Cougar Winery’s new Sangio’s Italian Deli – check out their menu here! Cook the bacon in a skillet on medium heat until crisp on both sides. Remove from skillet and lay out on paper towels to absorb the excess fat. Allow the bacon to cool. Crumble the bacon and set aside. Place the spring mix in a large salad bowl. Compose the salad. Arrange the turkey, bacon, tomato, and sliced hard boiled egg decoratively over the greens and garnish the salad with the kalamata olives and the blue cheese. Serve ranch dressing separately or toss in with the salad. Enjoy with a glass of Cougar Vineyard & Winery Sangio Rosso. In a bowl or a blender, combine all ingredients, adding other optional ingredients as you wish, tasting frequently and adjusting seasonings as needed. Chill for a couple of hours before serving; thin with milk or buttermilk if desired. 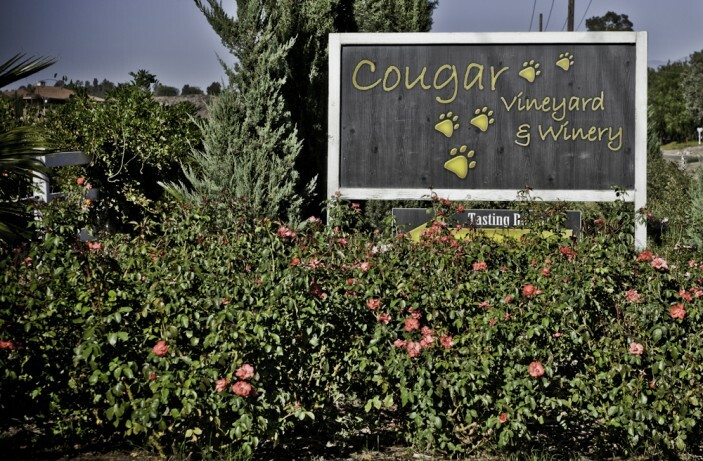 Cougar Vineyard & Winery is one of Temecula Valley’s smaller boutique wineries, producing approximately 4500 cases per year. Owners and winemakers Rick & Jennifer Buffington are passionate wine-lovers; they have been making wine for 20 years and are known for their hands-on approach to every aspect of the winery operations. Italian varietals are Cougar’s specialty. In addition to unique wines and fun-loving staff, this popular wine tasting stop also hosts cool events and boasts a devoted wine club following. 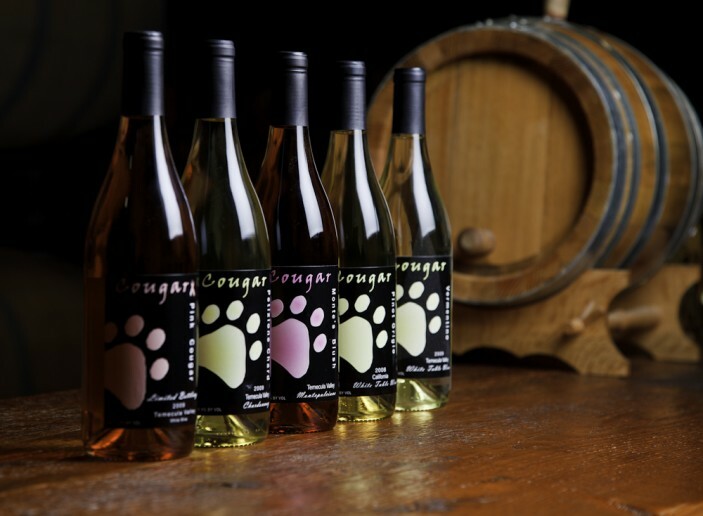 Cougar produces reds, whites, rosés, and sparkling wines so there’s a wine to suit every palate. Rick & Jennifer love to introduce rare and unique Mediterranean grapes to the Temecula wine scene. Cougar proudly offers lesser-known Italian varietals like Vermentino, Montepulciano and Brachetto. The latter was just recognized as a grape varietal in the United States and Cougar Vineyards is one of only two commercial wineries that are growing it. Visit Cougar’s wine store here! The Cougar Winery tasting room is open 7 days a week from 11-6pm. Vineyard tours and wine production tours are available Friday-Monday. 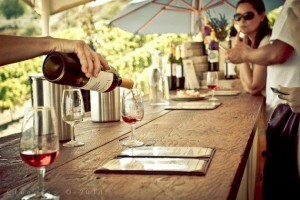 Call to reserve your spot at 951-491-0825 or visit www.cougarvineyards.com. Exciting news for spring 2013! Cougar Winery announces their new tasting room and eatery, Sangio’s Deli – opening in early spring 2013! The addition of another food stop on De Portola Road promises to provide hungry wine-lovers with even more options to fill up between sips. Get the latest news by visiting the Cougar blog. 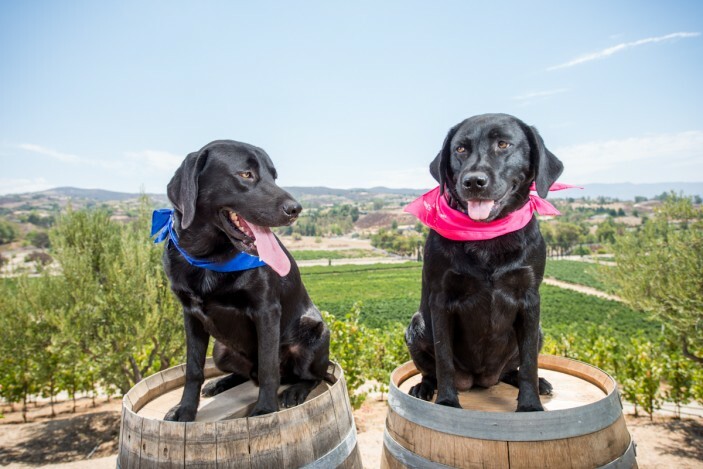 Make sure to say hi to black labs Monte and Mocha on your next visit to Cougar Winery & Vineyards! Place steaks in a glass dish. In a small bowl, whisk together olive oil, garlic, vinegar, rosemary, salt, and pepper. Marinate in refrigerator covered for 2 to 3 hours. Remove steaks from marinade when ready to grill. To make “butter”, combine all ingredients in a food processor or blender and process for about a minute until mixed thoroughly. Can be refrigerated, but plan to serve at room temperature. Prepare a hot fire and grill steaks for 5 to 6 minutes per side or until cooked to desired doneness. Shortly after turning, slather a mound of Gorgonzola butter on steaks and allow it to melt slightly while the steaks finish cooking. Serve with couscous and additional Gorgonzola butter. Enjoy with a nice glass of Cougar Meritage! Sometimes spritzy, always easy, Pinot Grigio is certainly a favorite white wine for spring. 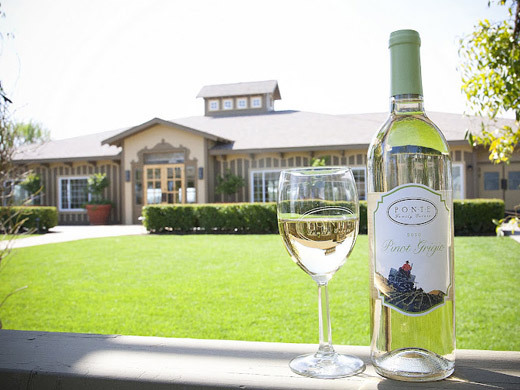 With its warm days and cool nights, Temecula is an ideal spot to grow Pinot Grigio, which requires plenty of sunshine to develop the vibrant apple and melon flavors for which it is known. And everyone enjoys drinking it, especially when paired with a chunk of aged Gouda cheese, Marcona almonds and dried apricots, a grilled salmon salad with a healthy squeeze of lemon, or a nice bowl of penne tossed with spring vegetables and butter. Below are five fun facts on this Old World varietal, plus some suggestions on where to pick up an affordable bottle at one of your local Temecucla Valley wineries. Pinot Gris (French) and Pinot Grigio (Italian) refer same grape – just different countries and different styles. Very closely related to the Pinot Noir grape, the grape normally has a grayish-blue skin, accounting for its name – gris meaning “grey” in French; pinot comes from the French word “pine cone,” which could have been given to it because the grapes grow in pine cone-shaped clusters. The first American Pinot Gris vines were planted in Oregon in 1966 by David Lett from Eyrie Vineyards. Pinot Gris grows well in the Central and South coastal areas of California. The Pinot Gris from California is often called Pinot Grigio because of its similarity in style to the wine of Italy. 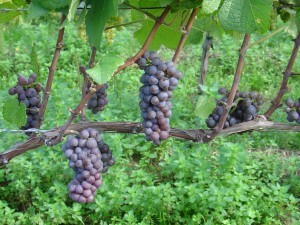 Pinot gris is considered an “early to market wine” – which means it can be bottled and out on the market within 4–12 weeks after fermentation. This white can be opened and consumed young.